My popular Art Quilts Exploration class is open for registration. Now, I realize the class doesn't start until January 24th, but I wanted you, my loyal blog readers to know first. It's a once a month (4th Sunday of the month, from 12-3) for 6 sessions, and there will be no class in May and July. One must register through Quilters Paradise in Escondido, where the class is held. It's a total bargain at $120, and sorry, no make up classes. Call (760) 738-9677 to register. Not to mention, it's a ton of fun. 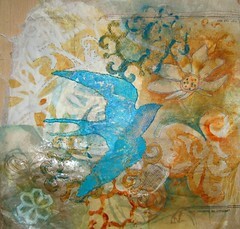 This piece is a fused collage called "Etruscan Bird" and we'll be learning this technique in one of the classes. Jane, I just want to tell you I saw your amazing felted quilt Zen Eucalyptus in Quilting Arts...and I left the mag open to that page all day so I could keep looking at it. It's flippin incredible.